At this year's Singapore Theatre Festival, organized by W!ld Rice, besides "Press Gang," I also watched "Supervision" written by Thomas Ng and directed by Glen Goei, a full-dress rehearsal of "An Actress Prepares" written by Alfian Sa'at, directed by Aidli 'Alin" Mosbit, and starring Siti Khalijah, and "One Metre Square: Voices from Sungei Road" co-created by San Mu and Zelda Tatiana Ng, and directed by Zelda Tatiana Ng. Why do establishment defenders rush to claim that a satirical work is "heavy-handed" when it finds its mark? Akshita Nanda, the arts correspondent of TheStraits Times, dismisses the new play by Tan Tarn How, "Press Gang," in just such a manner but she does not really address the accuracy of its depiction of the self-censorship rife in the newsroom of the fictitious Singapore Times or of the different personalities satirized in the play. How could she, after all? The people skewered are her colleagues and bosses. And, even more dangerously, her bosses' bosses, the current PAP government that has shown itself to be no friend to the press. It is not without reason that Singapore ranks 151st in the 2018 World Press Freedom Index, three places below Russia. 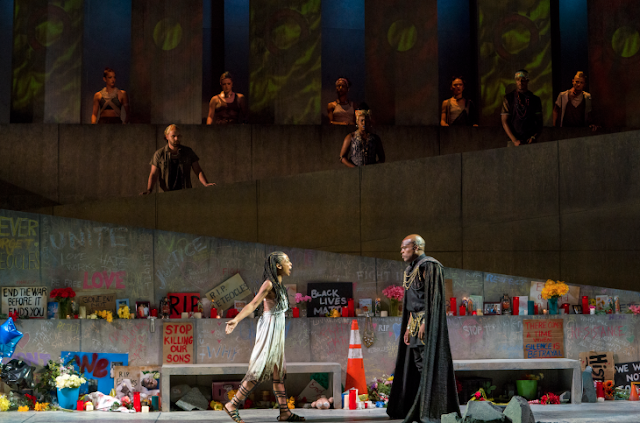 Last night, at the Richard Rodgers Amphitheater in Marcus Garvey Park, watched with GH the Classical Theatre of Harlem's production of Antigone, inspired by Paul Roche’s adaptation from the classic Greek tragedy by Sophocles, and directed by Carl Cofield. The set was tremendously impressive with a two-level ramp on the right, topped by columns, on both of which, ramp and columns, were projected images, colors, and protest graffiti. On the left was a grand flight of stairs going up to forbidding-looking glass doors. The actors were fine, but the best of them all was the man who played the comic Messenger. Stephen Burt's "Advice from the Lights"
Stephen (also Stephanie) Burt has made girlhood her territory, not looked back upon in nostalgia or regret, but as it is happening. Attacking it with memories, real and imagined, and with poems written after Callimachus and Baudelaire, she treats it appropriately with seriousness and artistry. Advice from the Lights is a fantastic feat of recall and imagination, rendered in language alive to its own possibilities. Hari Kunzru's White Tears is utter compelling. I've not read a novel as good as this one for a while. Gripping plot, complex characters, and beautiful writing combine with memorable set pieces to twist (or is it untwist) a yarn that is dyed in the history of blues in the USA. A novel that forces one to reconsider the deadly implications of cultural appropriation. At MoMA today, the revelation was Bodys Isek Kingelez's sculptural models of buildings and cities. Fanciful, colorful, utopian. "Without a model, you are nowhere. A nation that can't make models is a nation that doesn't understand things, a nation that doesn't live": Kingelez (1948-2015), based in then-Zaire, now the Democratic Republic of the Congo. Also saw the retrospective of Adrian Piper but was not as taken with it. The exception was a triptych of Madonnas and children, white in the central and biggest panel, flanked by black and Asian. The misery in the side panels comments ironically on the happiness in the center. Among the many gifts of patron Agnes Gund to the museum was a startling beautiful "Soundsuit" by Nick Cave. Perched on a mannequin was an elaborate construction of metal, beads, and ceramic birds and flowers of the kind commonly founded in antique or secondhand stores.